I love a good cable. When I came across this particular cable that looks kind of like a cross between a pretzel (yum!) and a four stranded braid (cute! 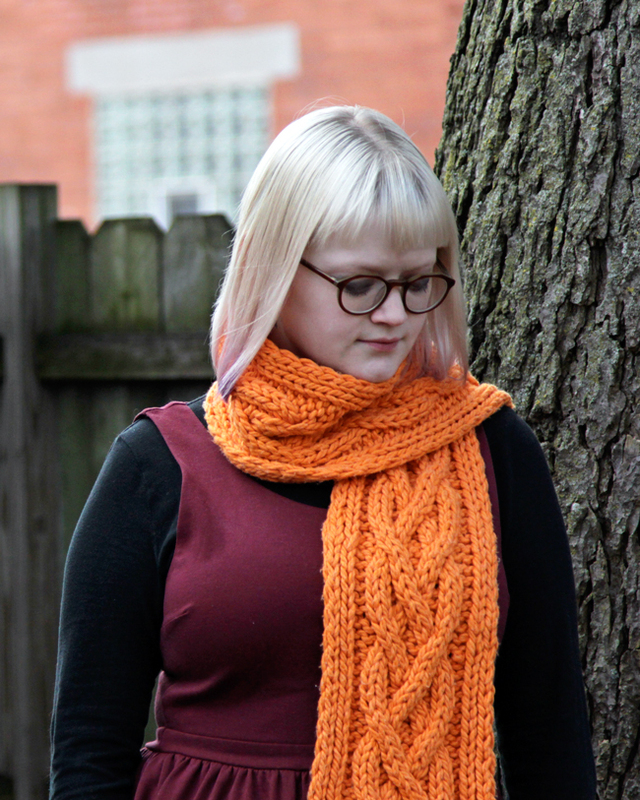 ), I immediately knew I wanted to make it the star of a fun pattern. 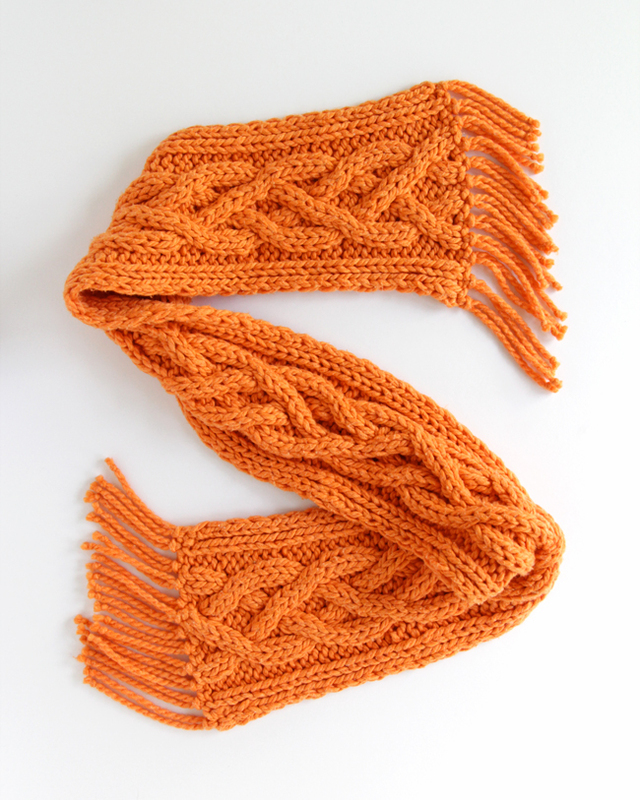 Cables knit in a nice, chunky yarn look so chic, don’t you think? And using a yarn with some cotton in it gives the stitches (and therefore the cables) lots of definition, on top of making the finished knit extra snuggly. 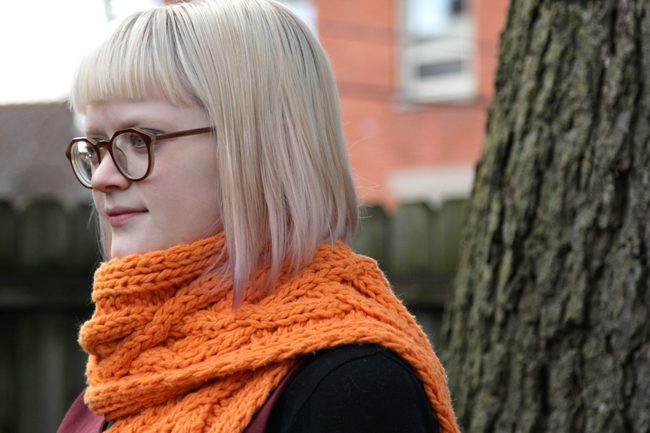 Basically this scarf is a quick knit thanks to the bulky yarn, and it’s complicated enough that you won’t get totally bored knitting a good old scarf. A win/win! 1. (WS) sl 1 wyif, p1, k1, p1, (k2, p2) twice, k1, (p2, k2) twice, (p1, k1) twice. 2. (RS) sl 1 wyif, k1, p1, k1, p2, k2, p2, sl next 3 sts to dpn and hold in back, k2, sl the purl st from dpn back to left-hand needle and purl it, then k2 from dpn; p2, k2, p2, k1, p1, k2. 4. (RS) sl 1 wyif, k1, p1, k1, p2, FC, BC, p1, FC, BC, p2, k1, p1, k2. 5. (WS) sl 1 wyif, p1, k1, p1, (k3, p4) twice, k3, (p1, k1) twice. 6. (RS) sl 1 wyif, k1, p1, k1, p3, sl next 2 sts to dpn and hold in back, k2, then k2 from dpn; p3, sl next 2 sts to dpn and hold in front, k2, then k2 from dpn; p3, k1, p1, k2. 8. (RS) sl 1 wyif, k1, p1, k1,p2, BC, FC, p1, BC, FC, p2, k1, p1, k2. 10. (RS) sl 1 wyif, k1, p1, k1, p2, k2, p2, sl the next 3 sts to dpn and hold in front, k2, then sl the purl st from dpn back to left-hand needle and purl it, then k2 from dpn; p2, k2, p2, k1, p1, k2. 11-16. Repeat rows 3 through 8. Repeat rows 1 through 16 fifteen times (or to desired length). BO all sts. 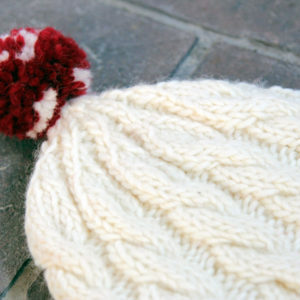 Cut several pieces of yarn to the same length. 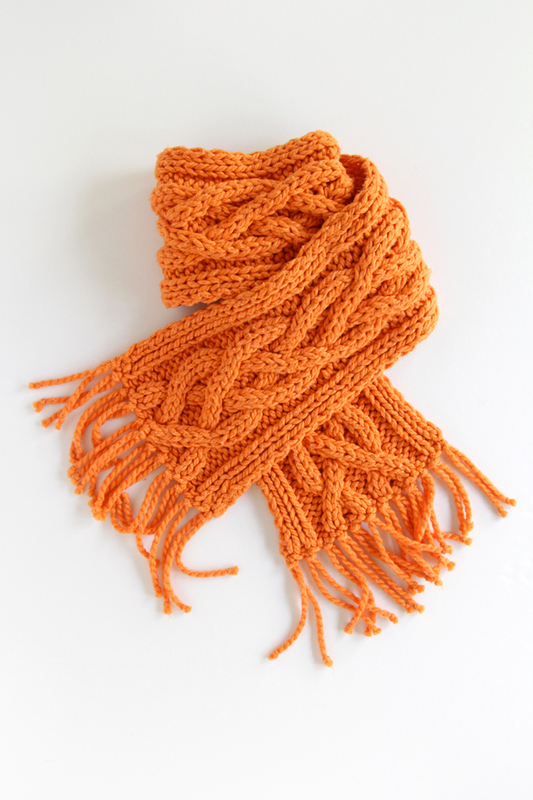 Using a crochet hook, attach fringe to each end of the scarf, knotting the ends of each piece of fringe to avoid fraying. Weave in ends and block to finish. 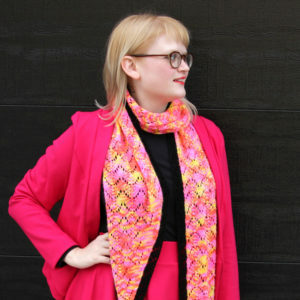 The Rhombuster Scarf is now available! 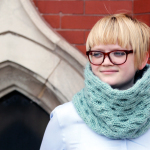 Faux Woven Cowl – The Warmest in the World! Yay, this pattern is really nice! 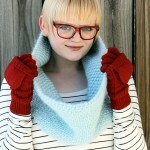 Finally I can make my own scarf! I am unable to print page 6; have printed pps 3-5,however just get a clean sheet of paper when I attempt to print page 6. Help. The most ink and paper efficient way to print this free pattern is to copy and paste the pattern text (highlighted in the teal box above) into a blank text document. Give that a try and see if it works out – let me know if I can help further!